Johnny O’Keefe was one of a kind, and he was proudly ours. Happy Birthday, wild one. It was the mid-1950s, the era that spawned rock and roll. Among the big international names were Johnnie Ray, Chuck Berry, Buddy Holly, Little Richard, Jerry Lee Lewis. Here in Australia we were still feeling our way with this new genre, and when in 1955, jazz and blues singer George Assang (also known as Vic Sabrino) released a version of Rock Around the Clock, the blues song recorded by American band Bill Haley and the Comets in 1954, it became quite possibly the first ever Australian rock and roll recording. But Assang was not our first rock and roll star. 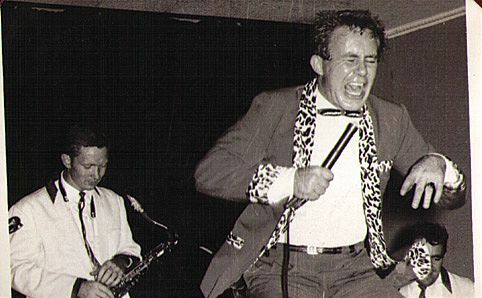 That title went to Johnny O’Keefe, whose recording of Wild One, one of the tracks on his first EP Shakin’ at the Stadium, was released in 1958. Wild One never got to the Top 10, but it was the very first Australian rock recording to get onto the national chart listing. Listening to it now, it may sound a bit tame but it hit the airwaves at a time when Australia was still very firmly entrenched in conservative values. The conservative government led by Prime Minister Robert Menzies had been in power for nine years and would stay there for another eight, and although our artistic and cultural wings had been steadily spreading beyond primarily British influences, society was nevertheless largely traditional and rather unadventurous. You need look no further than the earliest incarnation of Barry Humphries’ most inspired satirical character Dame Edna Everage to get an idea of the mundanity of suburban life in the 1950s. With suggestive lyrics like, “I’m gonna meet all the chicks/Shiver and a-shake it till I get-a my kicks”, Wild One made a big impression, and Australian rock and roll was well on its way to making its presence felt both at home and abroad. Born in the Sydney suburb of Bondi Junction in January 1935, Johnny O’Keefe was surrounded by music at home. His parents loved to sing and his mother was a fine pianist, so it was no surprise that Johnny sang in the school choir and joined the school band. He began an economics degree at Sydney University while working in his father’s furniture store, but the stage beckoned. Inspired by Johnnie Ray, he took up singing in earnest and in 1953 joined a band led by successful jazzman Gus Merzi who mentored the young singer, teaching him how to behave on stage and how to engage audiences, great training for his entry into rock and roll. A couple of years later, the stories say, Johnny heard Rock Around the Clock and decided to form his own rock and roll band, the Dee Jays, in 1956 with saxophonist Dave Owens. By the following year they had regular work at local dances, audiences drawn to Johnny’s confident irrepressible stage personality, not to mention the way he moved and the feeling he put into the songs they performed. He soon took to wearing some pretty eye-catching costumes on stage, such as his now famous bright red suit with leopard-print velvet trim (made by his mother), or an apple green suit complemented by a red bow-tie, or a snow-white dinner suit, or jazzy red leather loafers with a long white fringe. By all accounts, Johnny was energetic and enthusiastic both on stage and off. When he met renowned music promoter Lee Gordon in 1957, he soon scored the band a major gig as the support for Little Richard. The Dee Jays became the backing band for other international acts and also signed with Festival Records. And when Wild One was released in 1958, the catchy rhythm complemented by O’Keefe’s exuberant vocals, Johnny O’Keefe was on his way to stardom. The following year the Dee Jays were invited to appear on the popular music television program Six O’Clock Rock and before he knew it, Johnny became the host, involving himself in both production and artistic decisions. By 1960, he also had a regular radio program on the ABC and had become a household name. His 1959 release Shout, a cover version of the Isley Brothers hit, became one of his most popular songs. So closely is it associated with him that eight years after his death, that song provided the name for a television mini-series, and in 2001 it was used again as the title for the hit musical Shout! The Legend of the Wild One, celebrating Johnny’s life and career. A visit to America during 1959-1960 found him a US audience and he released She’s My Baby which attracted a respectable if unspectacular following, a disappointing outcome after touring and performing in 35 states. The American record company to which he’d signed dropped him and he came home exhausted. To make matters worse, some months later, Johnny was involved in a major car accident. He’d recently bought himself a car and liked to drive up and down the coast for days at a time. One June day in 1960, he was driving with Dee Jays saxophonist Johnny Greenan and Greenan’s pregnant wife when he ran right into a truck. No one was killed but injuries were severe. Janice Greenan lost her baby. Johnny had to be airlifted from Kempsey to Sydney for immediate surgery. He was treated for concussion and lacerations, and had over 60 stitches in his head, another 25 or so in his hands. His face was permanently scarred, something he found difficult to deal with, but—ever the trouper—he returned to work at Six O’Clock Rock within two months of the accident. He attempted another tour of the United States in 1961, but it was a fiasco and Johnny travelled to London where he reportedly had a nervous collapse. The pressures of work, the trauma of the accident and the slap in the face he felt at failing in America had taken a toll. His spirits were briefly buoyed when in 1961 he moved from the ABC to commercial television, hosting his own show The Johnny O’Keefe Show (later renamed Sing, Sing, Sing) which was hugely successful, but by then he was on a roller coaster of breakdowns and hospitalisations and the stress of having another television show just added to his fragility. With family and friends Johnny was open about his struggles, which can’t have been easy at a time when mental illness was not talked about, in fact, was hushed up as quickly as it became evident, but the public had no idea. Johnny released more songs in those early years of the 1960s, clocking up the hits and remaining popular with audiences. But as the decade progressed, musical tastes were changing and people were listening to The Beatles, The Rolling Stones, The Who. At home, rock and roll bands like The Easybeats, The Masters Apprentices, Billy Thorpe and the Aztecs and others were attracting young people not just with their music, but also their appearance. Good looking young men with long hair, come hither eyes and a more relaxed wardrobe were changing how the music scene looked and sounded, and Johnny’s style of rock and roll was becoming outdated in favour of the newer “beat” style. It didn’t help Johnny’s profile that he rejected the idea of having such bands on his television show. Of course, he continued to work and record and even compèred another television show, Where the Action Is, during 1967. A number of his songs made it into the Top 40, but things were slowing down for him, as is often the case with popular music acts. But Johnny had much to be proud of. Over the course of his career, he released more than 50 singles, over 40 EPs and well over 30 albums. 32 of his songs charted in Australia’s Top 40, including four Number 1 hits. He was an indefatigable performer, bringing unbridled enthusiasm and vitality to everything he did—singing, producing, recording, even retail. And here’s a little-known fact about Johnny, courtesy of writer Nikos Fotakis. At the height of his popularity, he sang and recorded in Greek on at least one occasion as a favour to a Greek-Australian record store owner whose shop was next to Johnny’s father’s. Fotakis writes: “The idea of a popular Australian artist singing in Greek in the 1960s—long before the concept of a ‘multicultural’ Australia—was unheard of.” So there’s another first! Frenetic schedules and often poor lifestyle choices have wreaked havoc on the personal lives of many entertainers. Back in 1958, Johnny married Marianne Willinzik. They had three children together but Johnny’s career, his way of life and his breakdowns put enormous tension on the relationship, and after eight years of marriage they divorced. In 1975 he married Maureen Maricic. They were together until his death. Since his near-fatal car accident, Johnny had endured a number of operations and had become increasingly reliant on drugs to control his pain. He also took medication for bipolar disorder. On October 6th 1978, he suffered a fatal heart attack apparently triggered by an accidental overdose of his prescription medication. He was only 43 years old. Johnny O’Keefe had a rawness and honesty to his voice and what he lacked in technique he made up for in showmanship. And what a work ethic! He was an indefatigable performer, bringing unbridled enthusiasm and vitality to everything he did—singing, producing, recording, even retail. He and Maureen had opened a boutique in the trendy Sydney suburb of Paddington only months before his death. As a young man, Johnny had changed the Australian popular music scene. He’d taken his music to America, he was a welcome face on television screens around the country. His energy and stage presence were legendary. When the Wild One died just over 40 years ago, Australia lost its very first bonafide rock and roll star.